The Windows Phone 8 has been announced today at the Developer Summit by Microsoft. The first highlight, and definitely most important, is what makes the Windows Phone 8 so different from Windows Phone 7 and Windows Phone 7.5. The difference is in the hardware for Windows Phone 8, that is the same reason we are advancing the Windows Phone to a new number, so to speak. Windows Phone 8 is due for release, along with new devices, this Fall 2012. Every single Windows Phone 8 device to be first available this fall will be equipped with the Qualcomm S4 processor inside. The processors inside will range from dual-core to multi-core, as the time for release approaches you can be sure more manufacturers will release device-specific processor information. The dual-core Snapdragon S4 processor has already been certified recently for Windows Phone 8 devices. Windows Phone 8 will allow for two new screen resolutions: WXGA 1280×768 with an aspect ratio of 15:9, and 720p 1280×720 with an aspect ratio of 16:9. You can clearly deduce which future Windows Phone 8 devices will most likely pack each resolution. “Low-tier” Windows Phones will rely more on the already available smaller resolution of WVGA 800×480 aspect ratio of 15:9. The big time Windows Phones (see: current Nokia Lumia 900) will boast the dubbed “720+” resolution, or the full 720p resolution with their bigger screen sizes being close to 4.3″. Whether you are excited or surprised about this hardware feature(! ), you can’t help but jump up and down at the fact that Windows Phone 8 devices will have true MicroSD support. This means you will be able to insert a MicroSD card into your Windows Phone 8 whenever you want (no more hard resets! ), and remove it whenever you want. Use your MicroSD to transport pictures, videos, and even applications between your other Microsoft devices. This hardware feature will also allow both manufacturers and carriers alike to reduce the price of desired Windows Phone 8 devices. If a customer wants more content or storage on their Windows Phone they can simply purchase a MicroSD separately. NFC wireless sharing support will also be a hardware feature for Windows Phone 8. We expect more small hardware features to be discovered down the line. 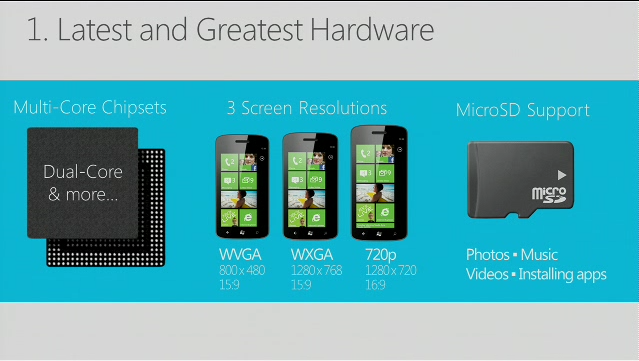 All hardware features above are set as must-haves by Microsoft to manufacturers of Windows Phone 8 devices. Therefore, you can expect every Windows Phone 8 device, beginning with those releasing later this year, to have multi-core chipsets, a selection of amazing resolutions depending on display size, and full MicroSD support.